I grew up in New Jersey, always on the lookout for The Jersey Devil, hoping (and terrified) that I’d spot him slinking out of the woods some night. As a teenager, my friends and I would head down to the shore to hang out on the boardwalk, and those dark rides back home at night with acres of impenetrable pine trees on either side of the road were another opportunity to search for this beast. Did I ever spot him? Well? I drew him, didn’t I? Whaddaya’ think, I just make this stuff up? What is that in the sky above the trees? Is it real? Photo-trickery? Tell that to the two construction workers who captured the monster’s image! Here’s their story from March of last year. But if that’s not recent enough for you, the BFRO reports a Jersey Devil sighting as recent as April of this year! Less than a month ago! Now, this eye-witness account doesn’t come with a photo or mention giant bat wings, but it’s a little creepy nonetheless. As always, these tales may go down easier with a grain of salt. Hey, you know what was a nice surprise? This wonderful little write-up the Pittsburgh City Paper did on Untold Tales of Bigfoot. I basically knew nothing about it until it hit the stands today. What a great surprise and a super-friendly thing to do. Thanks, Rebecca & CP! Bigfoot and Scout approve. This Saturday, I’ll be at Phantom of the Attic in Oakland from 10am to 5pm selling books and sketches, and chatting up anybody who wants to stop by. 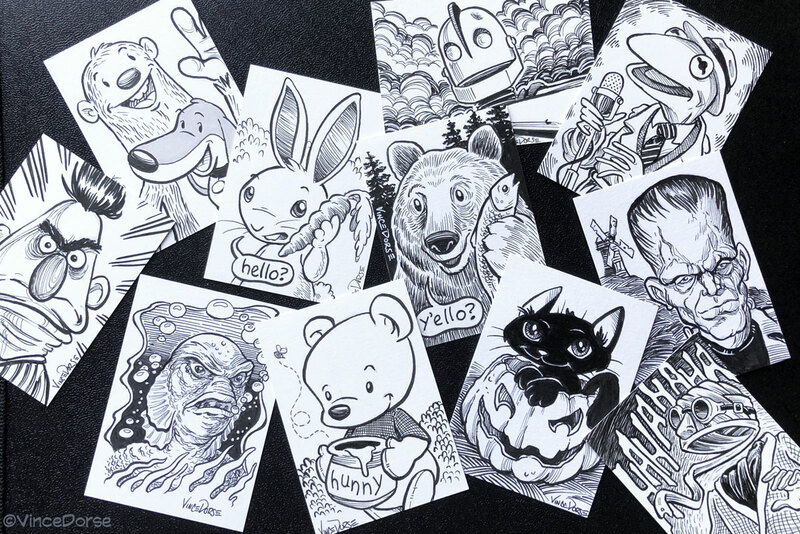 I’ve also been working maniacally to compile a stack of inexpensive sketch cards (maybe $5 – $15) for anyone who’d like some original art at a decent price. Well, having never been to Jersey, I was completely surprised and horrified! Hope they don’t expect our Bigfoot to double-cell with this thing! What’s next, a run with WWW? If so, we get to vote on costumes. Very cool coverage in PCP, congrats! Sure to bring you some new followers. They told me Mrs. Leeds’ 13th child was ugly, but this seems like a handsome Devil. Having grown up in Jersey myself, I think I may have seen this guy (or is it a gal?) before. Loving these new installments, Vince, you deserve that Reuben nomination! From what I’ve heard, the jersey devil has a rather vicious reputation. Hope Big doesn’t have to share that cell with him.